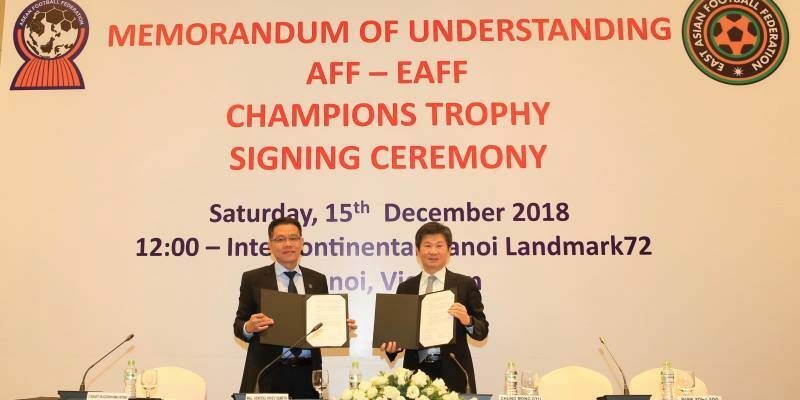 HANOI (15 Dec 2018) – The ASEAN Football Federation (AFF) and the EAST ASIAN Football Federation (EAFF) have introduced a new competition involving the national champions from both regions beginning next year. To be known as the AFF-EAFF Champions Trophy, this biennially-held event will feature the winners of the AFF Suzuki Cup and the EAFF E-1 competitions. AFF and EAFF will rotate the host venue duties, with the former staging the first-ever Champions Trophy. This means the winner of tonight’s AFF Suzuki Cup second-leg final between Vietnam and Malaysia will organise the inaugural Champions Trophy match and will battle South Korea, the reigning EAFF E-1 winner, next year. The AFF and EAFF penned the MOU for the Champions Trophy here today. AFF Deputy President, Maj General Khiev Sameth and EAFF President, Chung Mong Gyu signed on behalf of their respective organisations this morning. Next year’s Champions Trophy match, to be played on a single match format, will be scheduled during the FIFA International Match window on March 26, either in Malaysia or Vietnam.